Punjab Chief Minister Captain Amarinder Singh on Thursday announced his government’s decision to launch a New Employment Generation Programme for urban youth, to be titled, 'Mera Kam Mera Abhiman', to ensure dignity of labour.He was speaking here at the culmination of the fouth Job Fairs, and congratulated the 265 youngsters who got their job letters as part of the 10-day long job fairs held in all 22 districts under state’s ambitious Ghar Ghar Rozgar & Karobar mission. They had got recruited or placed in different Government and private sectors out of total 40517 selected for jobs during this phase of the job fairs.Giving details of the State Level Mega Job Fairs, the Chief Minister said that under the Rozgar Mission the State Government was facilitating 808 youth per day in getting jobs and this number would be increased to 1000 per day soon. The aim of this mission is to provide one job for each family in a time bound manner and the scheme would certainly reach out to every household, he added. The Chief Minister said that the state witnessed only five percent placements during its maiden job fair held in August-September 2017, with placement of 19,415 followed by 16 percent in February-March 2018 with placement of 11,821 youngsters. The Chief Minister said that in the third Job fair the placement percentage jumped to 21 percent with 18672 placements and now in the fourth mega job fair the rate of placement was 55 percent. He said that out of the total 1.13 lakh jobs offered in this 10-day long job fair held at 54 venues, as many as 41878 placements were secured while 4370 aspirants were facilitated for self-employment. 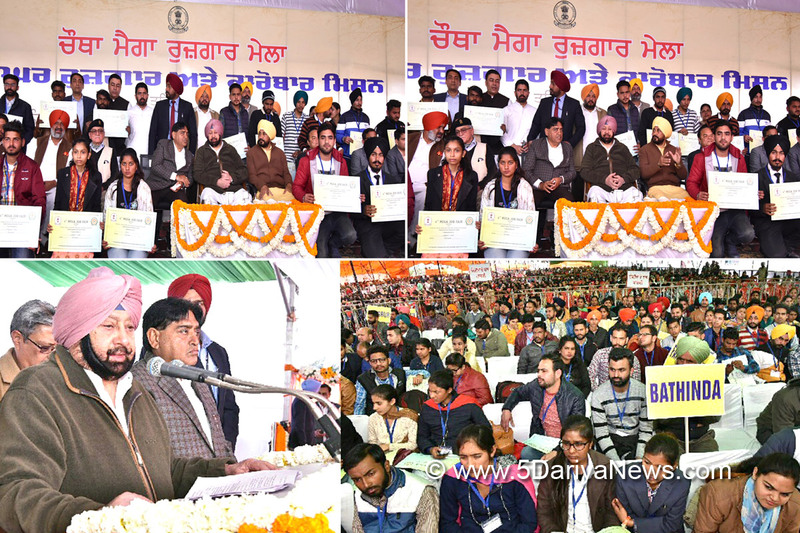 The Chief Minister also pointed out that Ghar-Ghar Rozgar – Poor First was prioritizing the poor in skill development and provision of employment. He said that under it, a unique initiative to provide jobs to atleast 10 poor jobless youth of every village had been undertaken to ensure universal reach of the Scheme. Appreciating the efforts of Employment Generation Department, its Team and District Employment Bureaus, the Chief Minister said that till date a total of 5.76 lakh youth had been facilitated in getting employment in Private / Govt. Sector or Self-Employment ever since March 2017 with 40213 Government recruitment, 1.71 lakh Private Placement and 3.65 lakh facilitates for Self-employment. Acceding to the demand of Kartarpur MLA Chaudhary Surinder Singh for setting up an industrial unit in his constituency as they have an ample chunk of land at village Jandu Singha, the Chief Minister asked the Industry minister to look into the modalities in this regard so as to ensure further industrial development in this region.The Chief Minister also lauded and awarded the District Employment Officers of Ludhiana, Patiala and Sangrur districts with the title of Best Performing Officers, he and exhorted the others districts to also achieve excellence in providing jobs to unemployed youth. He said that the state had established District Bureaus of Employment and Enterprise (DBEE) in every district and dedicated to public on November 21, 2018, which were fully functional now as a one stop shop for youth for career guidance, counselling, placement assistance, registration, Internet Surfing etc. The Chief Minister said that a GGRK Portal had also been developed and nearly 3.3 lakh youth have registered themselves on this portal.Earlier, Employment Generation Minister Charanjit Singh Channi lambasted the previous Government for devastating the state in all fields. He said that Captain Amarinder Singh led Punjab Government was fulfilling all promises made to the people during run-up to the assembly polls. He said that earlier the state had waived off farm debt up to Rs 2 lakh and now it was taking new strides in providing jobs under Ghar Ghar Rozgar mission. The Minister also informed that the State had transferred the land to Punjab Technical University for setting up of Sri Guru Gobind Singh Skill Development University at Sri Chamkaur Sahib and besides that Rs 312 crore would be spent to setup a Skill Centre at PTU campus and at Sultanpur Lodhi.Prominent amongst others present on the occasion were Industries and Commerce Minister Sunder Sham Arora, Senior Advisor to CM Lt. Gen (Retd) T S Shergill, Media Advisor to CM Raveen Thukral, Member Parliament Chaudhary Santokh Singh, MLAs Pargat Singh, Chaudhary Surinder Singh, Hardev Singh Ladiand Raj Kumar. Chabbewal, former Lt Governor Puducherry Iqbal Singh, Former Chairman Jalandhar Improvement Trust Tejinder Singh Bittu, General Secretary Punjab Congress Chaudhary Vikram Singh, Principal Secretary Technical Education and Industrial Training DK Tiwari, Mission Director Ghar Ghar Rozgar Rahul Tiwari, Commissioner V Pirushartha and Deputy Commissioner Varinder Kumar Sharma.